Photograph by R. Johnson. 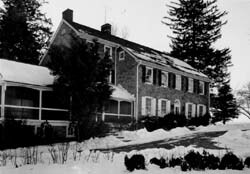 Courtesy of the Pennsylvania Historical and Museum Commission. A pillar of Reading's black community for 160 years, the Bethel AME Church stands as a testament to the hard work and accomplishments of free African Americans during the era of slavery. 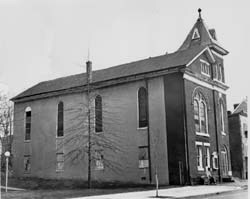 Built in 1837, Bethel is the only AME church in Berks County that was constructed through the private resources of its congregation, many of whom were employed in Reading's iron industry. The four founding members of the church were Jacob Ross, George Dillen, Isaac Parker, and Samuel Murray, who was primarily responsible for the construction of the church. A local shoemaker, Murray owned 13 local properties and used them all as collateral to finance the church. He also obtained a licence to preach, and subsequently became the first pastor of Bethel AME Church. During the years leading up to the Civil War, the congregation of Bethel was active in the Underground Railroad and members often harbored fugitive slaves escaping northward. Jacob Ross, one of the founding members of the church, was himself a runaway slave from Virginia who had found support in the local black community and decided to settle in Reading. Today, Bethel AME serves not only as a place of worship, but also as a referral, social, and cultural center to the community.